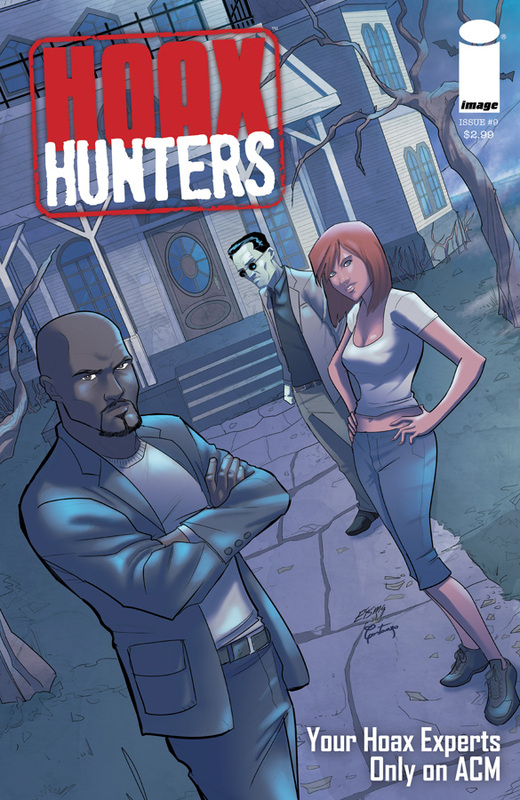 The Fellowship was fortunate enough to obtain a copy of HOAX HUNTERS #9 from Image Comics. The story is by Michael Moreci and Steve Seeley, art by Brent Schoonover, colors by Rosario Costanzo, and lettering by Jim Campbell. Due to popular demand, the Hoax Hunter team decides to investigate the well-known haunted Laramie home. According to legend, a married couple was murdered in the house two decades earlier. No one knew what happened to their six-year old daughter. Since then, no one has lived there for more than three years. The team is there to prove that the reports of supernatural activity are false and the spirit of the little girl is not roaming the hallways of the abandoned house. What is cool about this issue is it’s a flip book. On one side you read the story as if you are watching the episode of Hoax Hunters. The other side tells a different story as you see what really happened to the team that night. Moreci and Seeley treat you to a great story with the right amount of humor, action, and horror. Schoonover’s art and Costanzo’s colors compliment the story real well. This issue is the perfect jumping on point if you are interested in the book. HOAX HUNTERS #9 is in stores now or available at www.imagecomics.com.